On Valentine’s Day when I was little, we had a valentines exchange at school. Do kids still do that? 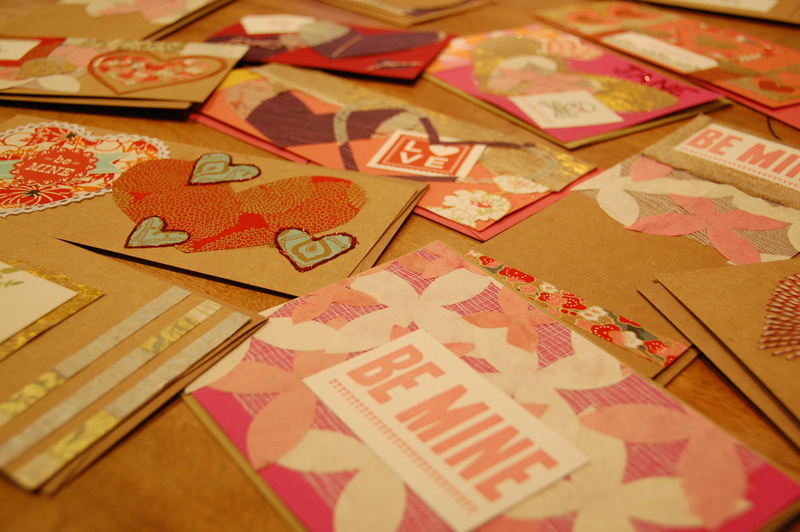 I was one of the few kids who’s mother would not let them buy their valentines. So Megan and I would sit at the dining room table with doilies, red paper, scissors, and whatever else to create a valentine for every last member of our class. Sometimes when I was little I wished we could be normal. But not anymore. I realize that my mother instilled in me a need to be creative and I absolutely love that she also provided outlets to use that creativity. One of those outlets is through valentines. For some strange reason, that little ritual stuck. Even in college, I would sit in the floor of my dorm and create valentines for my friends to receive in their ACU mailboxes and for my parents. Now I send them to a collection of folks. It is interesting how something like this can become an easy way to love on folks without a traditional valentine. 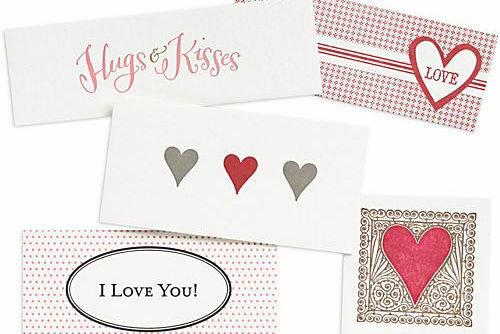 And it makes me realize how fun valentine’s day is–regardless of whether one is single, dating, married, widowed, or whatever–the day is a sweet one to celebrate love of all kinds. We are all loved by someone, if only Christ Himself. And that is worth celebrating. 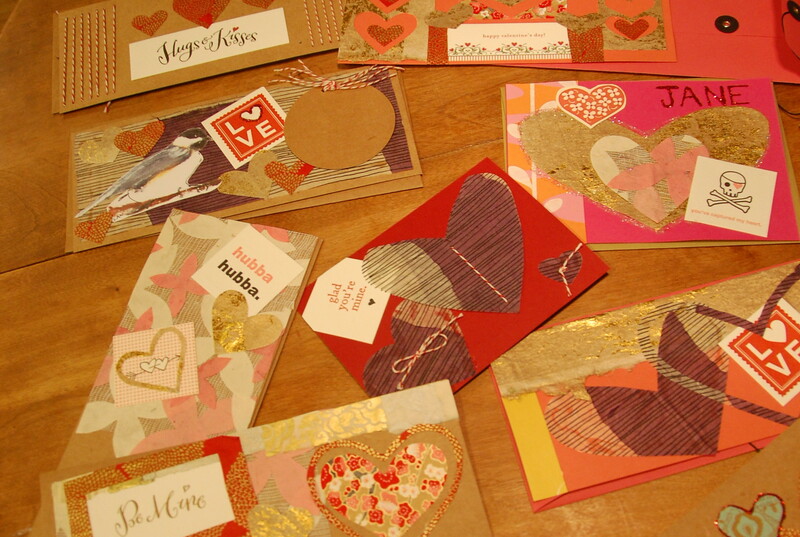 Some years are more lavish than others, but at the very least, our family would make valentines for each other. And when Jane was born, we roped her in. This year was the first year that Meg, Mom, Jane and I all had the opportunity to make some together. 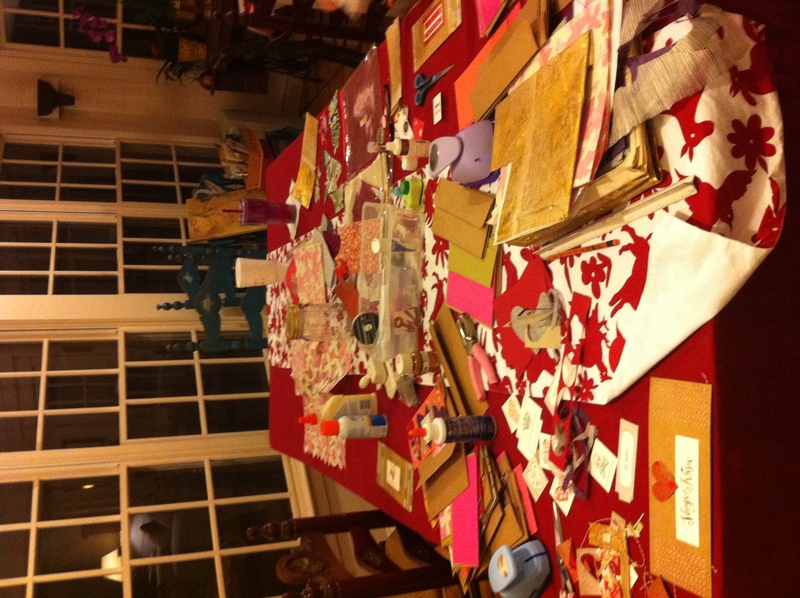 Here’s what my mom’s dining room table looked like in the process. 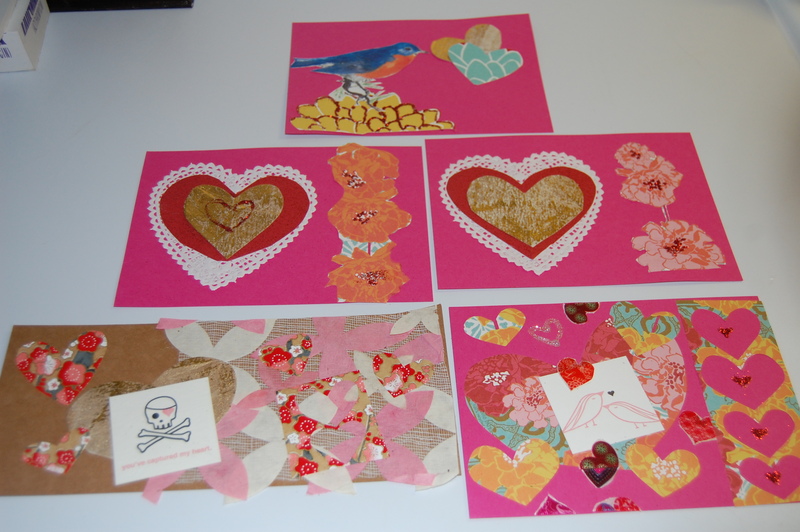 I think Jane was honored to be included in the “adult valentine-making” experience. We let her use the fancy paper and she got control of the glue. And she does really great work, if I do say so myself. To translate, this says, “To Dad. I (heart) u. Jane.” And that message represents a lot of hard work. I think she would have said, “Daddy” if it didn’t require two more letters out of her. I have a big box of valentine supplies. 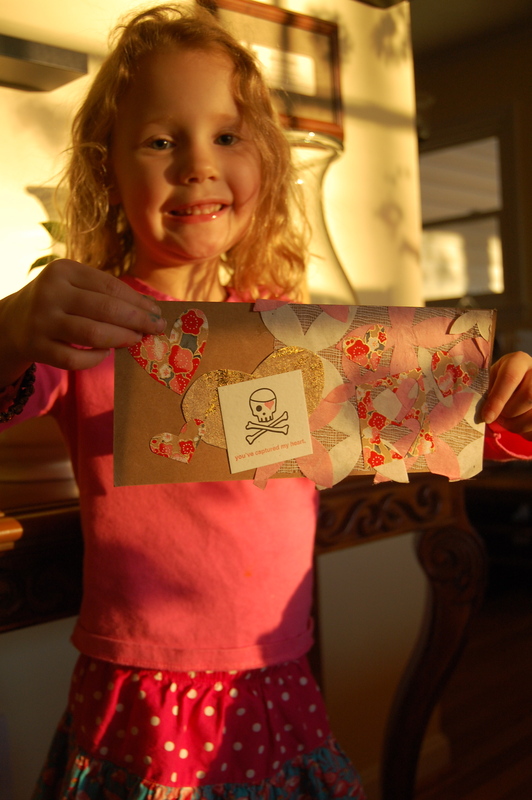 The box contains glitter, scraps of paper, scissors, card stock, and left over envelopes from various other projects. Each year we pick up a few additions. This year’s includes the below supplies from Paper Source. Oh, how I love me some Paper Source. 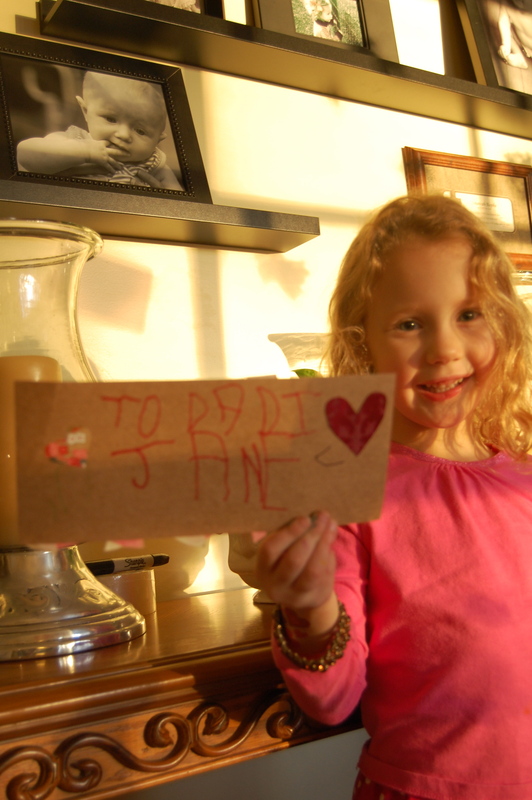 I just read this today, and Molly just sat down and made 16 valentines for her preschool classmates–they are 3 and 4. Her valentines mainly included stickers, and I will write “Happy Valentines Day” on the front, and she can write her name on the back (which is the only word she can write). I love that you posted this. thanks!